Spectators at this year’s World Cup tournament in Brazil are enjoying an improved viewing experience thanks to SABIC’s durable, impact- and weather-resistant LEXAN™ sheet and system solutions used in the construction of two of the stadiums. SABIC has provided 53,620m2 of roof glazing and facades for a total of four arenas in Brazil, including two of the World Cup stadiums. Architects who designed the Arena Pantanal in Cuiabá and Arena da Baixada in Curitiba selected SABIC’s high-performance LEXAN™ sheet and system solutions to create lightweight, high-impact and UV-resistant roofing and facades that helped meet strict safety compliance and sustainability aims, while offering outstanding aesthetics. These are just some examples of the more than 50 stadiums across the world where SABIC’s materials have been used. “For many years, SABIC solutions and technical expertise have helped architects and contractors design and build some of the world’s most iconic stadiums. 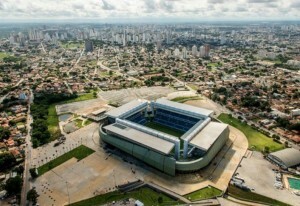 Today marks a significant achievement with the addition of awe-inspiring arenas in Brazil that are benefitting from the design freedom, energy efficiency and high performance of our LEXAN sheet portfolio, which is helping designers and architects ensure safety while creating a dramatic architectural statement,” said Jack Govers, General Manager of Specialty & Sheet business at SABIC. 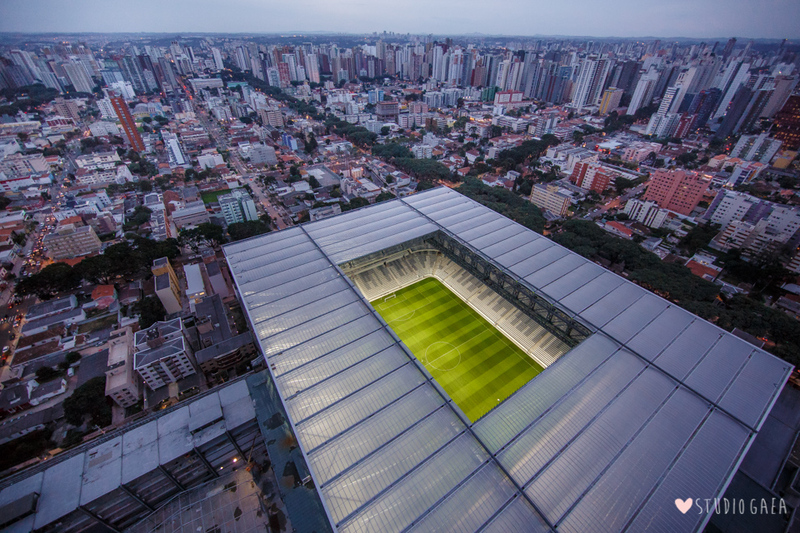 At Arena Pantanal, where teams such as Japan, Columbia and Russia played their group stage matches, the use of LEXAN EXELL™ D sheet roofing helped architects with their sustainable approach to the construction of the arena, nicknamed ‘O Verdão’ (The Big Green). The durable, virtually unbreakable 9.5mm sheet provides natural light and optimizes energy performance through improved thermal insulation. As the sheet can be easily cold-formed into gentle curves, it is a good candidate material for skylights, covered walkways and barrel vaults. This material is backed by a 10-year limited written warranty against yellowing, loss of light transmission and breakage. SABIC’s portfolio of solutions for the stadium building industry also includes multi-layer LEXAN THERMOCLEAR™ sheet, which was used for the roof at Arena da Baixada where Spain, Honduras and Russia played this year. A material of choice for glazing applications where thermal insulation is a major consideration, energy savings of more than 50% compared with monolayer glass are possible thanks to the highly reflective surface of the sheet. Additionally, the sheet offers outstanding impact performance over a wide temperature range (-40°C to 120°C) and has excellent resistance against degradation from UV radiation. At Arena da Baixada, architects used LEXAN THERMOCLICK™ sheet systems to clad the façade of the stadium. With a unique five-wall X-structure, the 40mm sheet system offers high light transmission and light diffusion, and superb thermal insulation, which can help reduce power consumption by up to 17% compared with traditional double-pane glass glazing. Helping stadium management to ensure the safety of spectators, the solutions used in the World Cup arenas comply with industry-recognised fire and smoke ratings and as all LEXAN sheet solutions offer up to 250 times the impact resistance of glass, risk of breakage from extreme weather or vandalism is reduced. Additionally, as LEXAN THERMOCLEAR is up to 50% lighter than glass, it is easier to handle and install compared with heavy glass panes. The solution can be used with a lighter supporting steel framework than glass requires which may reduce material and shipping costs, and facilitate fast installation. SABIC’s solutions for the stadium construction industry have also been installed in two additional arenas in Brazil: Coritiba Football Club Stadium in Curitiba and Arena Gremio in Porto Alegre. 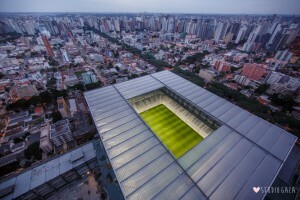 At Arena Gremio, customised blue LEXAN THERMOCLEAR sheet was used for the roof. The durability and impact resistance of the sheet allowed it to remain undamaged following a violent windstorm during the stadium’s construction. Description: SABIC’s lightweight, high impact and weather-resistant LEXAN™ THERMOCLEAR™ and LEXAN THERMOCLICK™ sheets are chosen to construct total 32,000m2 roof glazing and facades of Arena da Baixada in Curitiba. SABIC’s virtually unbreakable products can help reduce the risk of breakage from wind, hail, and other extreme weather, as well as vandalism but also to provide a superb thermal insulation, leading to energy savings by reducing power consumption. Description: SABIC’s remarkably tough, lightweight high-impact, fire and UV-resistant monolithic material, LEXAN™ EXELL™ D sheet, is chosen to create the 12,900m2 roofing and glazing of the stunning new Arena Pantanal in Cuiabá. SABIC product provides spectators with an excellent viewing experience along with and protecting spectators from changing weather conditions.